The tragedy of what's happening right now is that Billy Graham long ago made a personal commitment to avoid picking political sides, especially since being tricked by Richard Nixon in the 1970s in a case that led to a public apology in 2002 after tapes of their private Oval Office conversations were released. Up until this point, the Nixon debacle was arguably Billy's only political misstep, but with each new anti-gay statement put out by BGEA his legacy is being tarnished. Steve Knight is Minister for Missional Initiatives with Hope Partnership for Missional Transformation and Community Architect for TransFORM Network. He blogs about the missional church at his Missional Shift blog. This column originally appeared via Huffington Post. Images: Billy Graham preaches at the Greater New York Billy Graham Crusade June 25, 2005 in Flushing, New York. Photo by Anthony Correia/Shutterstock. 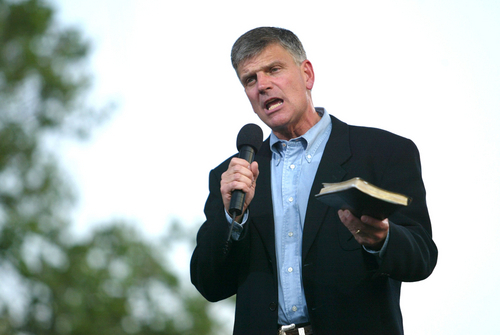 Franklin Graham at the same event in 2005, also by Anthony Correia/Shutterstock.